Today the World Cup games begin. This is an awesome learning opportunity para nuestros niños. There are so many activities for so many grade levels. Kids can learn about something as simple as colors, numbers, and animals to more complex subjects such as geography, politics and cultures. Check out Multilingual Living's article, Bilingual Homeschooling: World Cup Language Learning, which has some fabulous ideas for lessons using the FIFA website and others. If you'd like to check out all the mascots from previous years, check out LAS MASCOTAS DE MUNDIALES ANTERIORES. Just for fun, visit MeEncanta.com where you can upload a picture of yourself then choose your favorite team and see their country's flag reflected off your face! There are lots (and I mean LOTS) of pages and games on soccer over at YoDibujo.com. Check out this link in particular. Maybe you'd like to set up your own Mini Word Cup? Gather together all your niños, sobrinos, primos etc. and have a little match of your own! 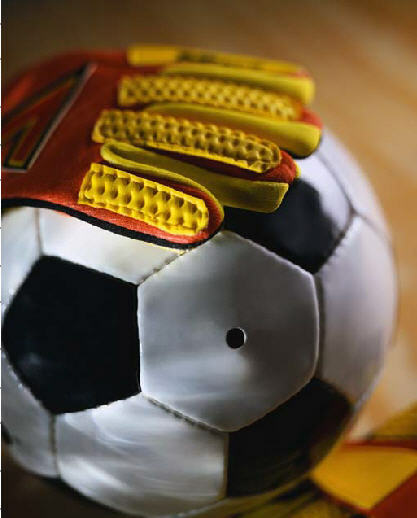 For some simple facts on soccer, click here. And here's a crazy one: have your students find out why baboons are a 2010 Soccer World Cup problem with this lesson for elementary grade children (there is a link to a lesson plan for older kids). Oh goodness, thank you for linking to the Bilingual Homeschooling lesson on the World Cup! I didn't see it before, so glad you pointed it out. So appreciated! I look forward to returning the links as well!